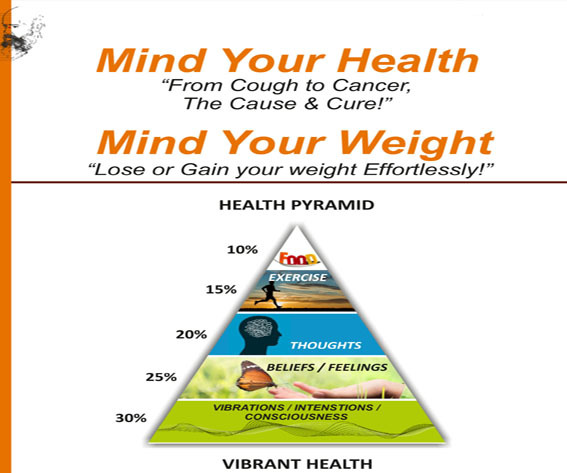 MIND YOUR HEALTH & WEIGHT ! Our Health depends on several factors like food, air, water, sunlight, environment, personal habits, mental patterns, emotional temperament, inter-personal relationships and many more. A well balanced combination of all the 5 areas of Body, Prana, Mind, Intellect and Consciousness leads to energetic and vibrant HEALTH!. HEALTH is a state of complete physical, mental, emotional, social and spiritual well-being. HOW do we maintain vibrant HEALTH? The workshop gives a wholesome understanding for enhancing all the 5 Koshas. Resolve deep set health issues ranging from cough, cold, acidity, blood pressure, diabetes, cancer by a simple implementation of specific techniques. Practice wholistic processes like EFT, EET, TMS, Soham etc in your every day life. Develop wholesome food and exercise habits. Explore how to manage all the 5 aspects which are instrumental in creating high energy, immense enthusiasm and vibrant Health. Attain the ideal weight you want! Lose or Gain Kilograms with ease! Normally, we think of “Weight Loss'”, we focus mainly on food and exercise i.e. diet and physical fitness. Most programs target your eating and physical habits. By focusing on All the 5 koshas, the WEIGHT plan covers all aspects of food, exercise, thoughts, intellect, beliefs, feelings, vision, consciousness, and vibrations. Practice a balanced and natural way of being the ideal weight and vibrant health you want! It is a comprehensive approach to achieving immense Happiness through high-powered, dynamic and vibrant Health!